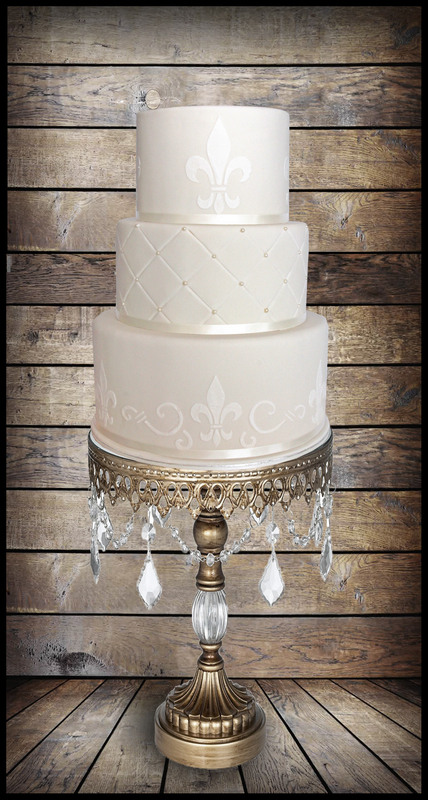 Whether you are looking for a contemporary chocolate wedding cake, a cup cake tower or an elaborate traditional fruit cake, I will create your dream. 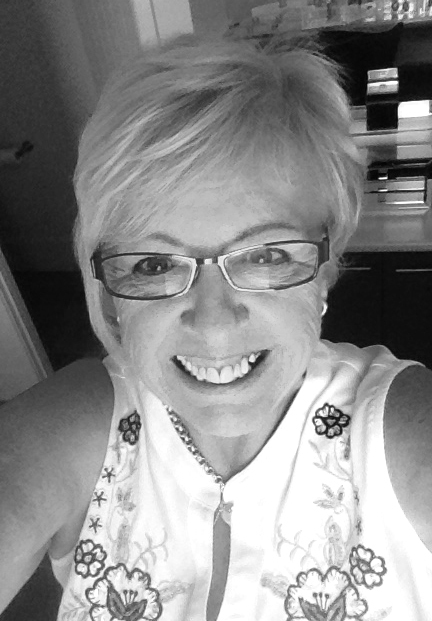 I am happy to have a consultation with you in person at my home here in Pottsville Beach, to help you decide what would suit you best, or you can talk to me via email and telephone. What about treating your guests to some hand made wedding favours. Iced cookies designed especially for you and monogramed if required? I started off by rolling out a 50/50 mix of fondant and gum paste to about 1/8″ thickness….go even thinner if you can. I like thin ruffles! – After rolling, cut the fondant into strips. 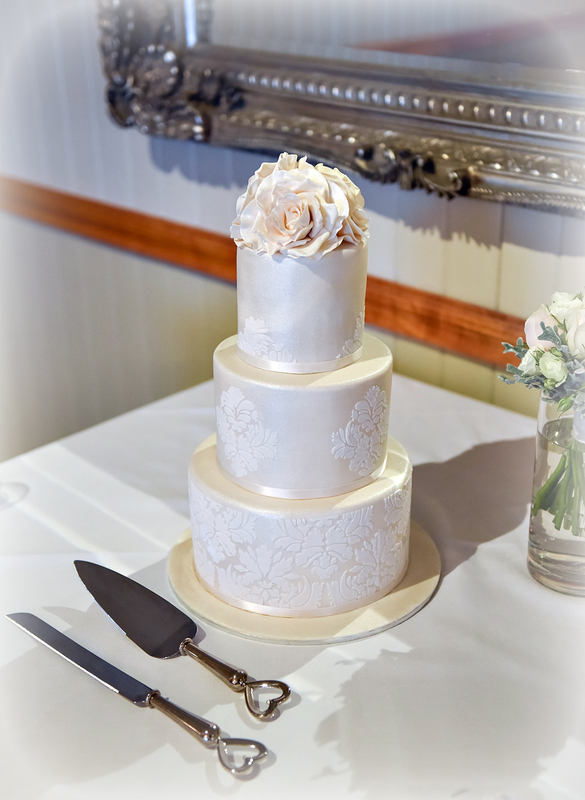 I have a fondant ribbon cutter which sped things up a bit…but you can use a sharp knife too and just eyeball it. I cut about six, approx. 12 inch long strips, which were about 1/2 inch wide. Make more up as you go. The other strips of fondant were waiting for their turn under a piece of vinyl to keep them from drying out. You can also keep them under some cling film while they wait. 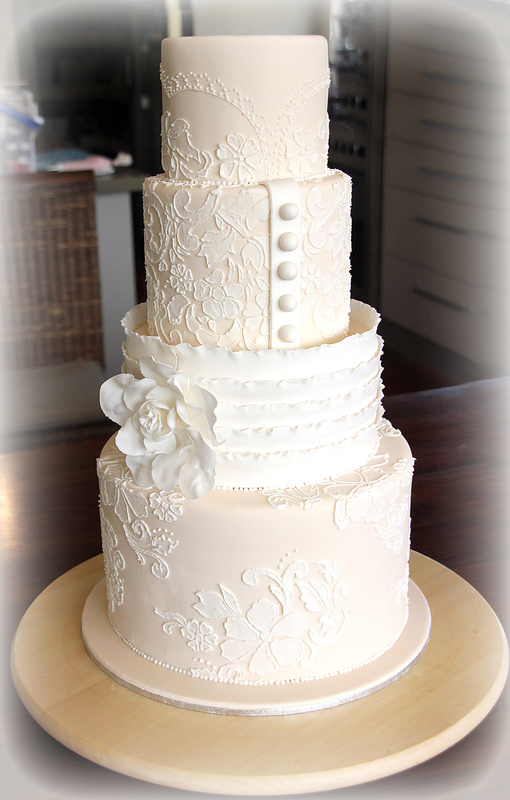 Decide how big a flower you want to make, and draw outlines lightly on the surface of your cake. Use a paint brush to brush on some piping gel where your first strip will be placed. 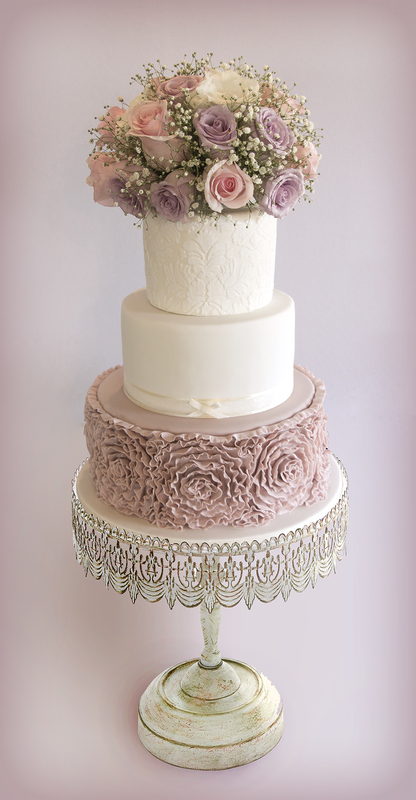 Don’t press the frilly edge of the fondant into the glue–you’ll need that fluffiness for dimension. Continue with your circular pattern, brushing the area with piping gel and then wrapping around your fondantIt Once almost full. 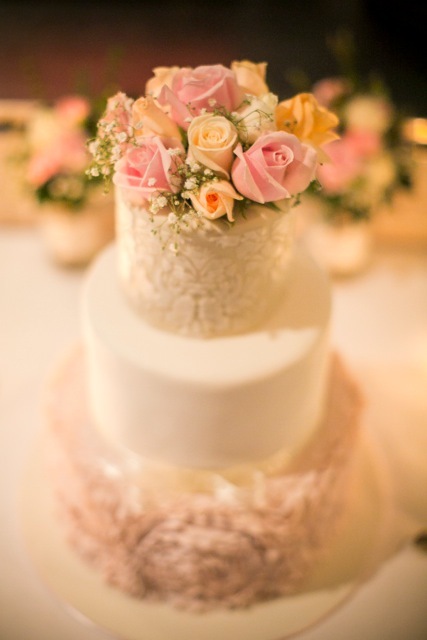 The last little space in the center of the flower can be filled by rolling a piece of fondant into a loose rosebud shape. You can use a toothpick or Q-tip to manipulate the petals however you like. Any droopy frills can be supported by toothpick until firm. Thank yo for your lovely comment. 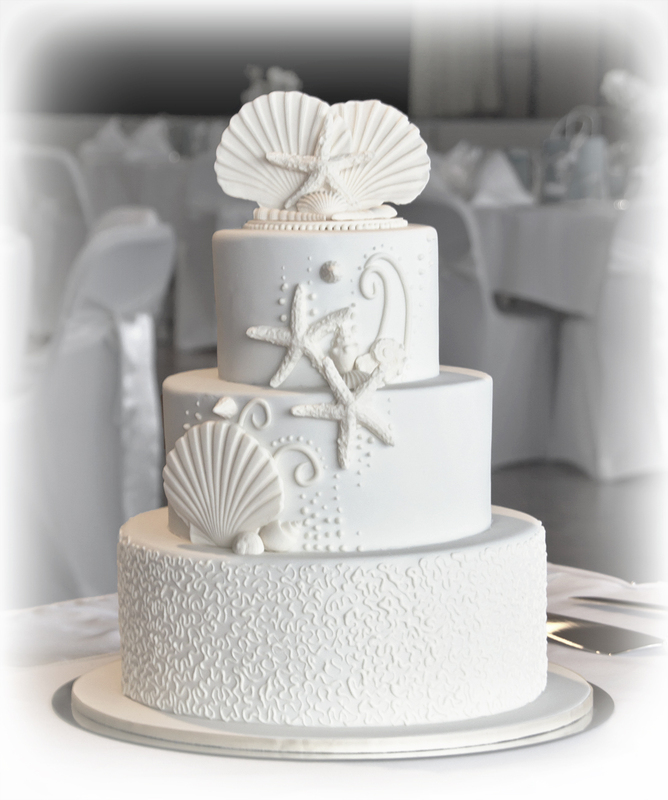 I am searching for someone to make our wedding cake for 16th April 2016 in Kingscliff. The cake would need to feed approx 80-90 people and I would be looking at a 3 tier cake. I am not sure what flavours yet but I have like the vintage or rustic styles so far. Are you able to send me approx pricing? Hi, getting married in Tumbulgum, 04 Jan 19, are you available? We are interested in getting a cake pop cake with tiers and the top tier being an acutal cake. Is this something you could do? I have a photo which I can send you via email which gives a idea of what I mean.